In 1963 the General was a geriatric 91-year-old man who was given a new olympic caliber heart by Dr. Olga as part of plan to extend the life of those she could use to shape the world to her desires. 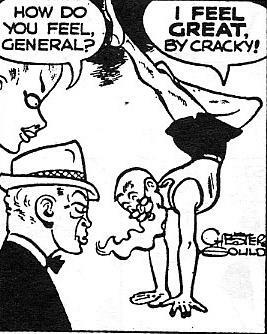 When Olga showed Smallmouth Bass her gym, the General was present manner of gymnastic feats including the running of a four-minute mile. After Smallmouth’s death and Olga’s arrest for murder, it’s unclear what became of the General.